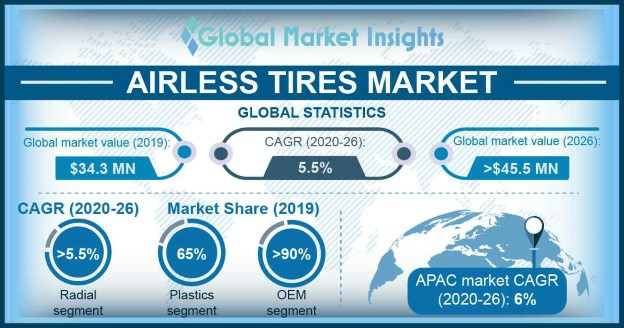 Airless Tires Market Size « Global Market Insights, Inc.
Airless tires market has indeed gained a commendable acclaim over the recent years, especially amidst the backdrop where disruptive tech driven trends are aptly reshaping the mobility sector. Given that forces like diverse mobility, connectivity, autonomous driving, and electrification are already on the horizon, it is expected that airless tires industry would soon conveniently establish itself as the next lucrative investment avenue. This is apparently vivid from the estimates that claim the global airless tires market to have garnered a revenue of USD 120 million in 2016. The growth is chiefly driven by the increasing demand for these next generation tires in heavy off-load vehicles, widely used across the military sector. In fact, military vehicles procured a prominent chunk of the airless tires industry landscape in 2016 and is anticipated to record a CAGR of 9% over 2017-2024. The concept of 3D printing is deemed to bring a disruption of sorts in the airless tires industry. Having recognized the immense potential of this technology, market players have been increasingly experimenting with 3D printing to unlock its credibility to the fullest. Quoting a recent case, Michelin, one of the leading airless tires market firms has recently made its way to the front page with the launch of its airless 3D printed tire. This breakthrough model is reportedly based on alveolar structure, similar to that of air sacs found on human lungs. That is to say that the interior of the tires are structurally solid while the outer layer is flexible, which prevent blowouts. What adds an extra feather to its hat is the product’s environmental viability – it is printed from biodegradable, organic, and recyclable materials. Elaborating further on the competitive landscape, product innovations and development are the two prominent parameters underlining the sustainability quotient for the market players. Below are two of the latest developments in the product landscape of airless tires market. Goodyear Tire & Rubber Company, one of predominant players in airless tires market, has recently released an airless or non-pneumatic turf tire solution for commercial mower applications. Reported to be exclusively available on Bad Boy Mowers’ Outlaw XP model, this groundbreaking airless tire technology is particularly designed to eliminate air pressure checks, and flat tires. The move is claimed to be a revolution with regard to the launch of non-pneumatic technologies in the automotive sector and is deemed to remarkably strengthen Goodyear’s position in the competitive landscape of airless tires industry. World’s first 3D printed airless bicycle tires have been recently tested on the streets of Berlin- the latest scoop that is grabbing the headlines in airless tires market. Reportedly, BigRep, the Berlin based tech giant has tested this new Pro Flex filament tire, which is claimed to be superior than other 3D printing filaments in terms of its unique flexibility, high resistance, and unmatched durability. With airless tires becoming a renowned trend in the transportation space, the move is certain to provide a remarkable competitive edge to BigRep. It is vividly coherent that technological upgradations in product design and deployment are the top-notch parameters underlining the strategic landscape of this fraternity. The business space is set to garner an appreciable popularity across APAC belt, especially by the extensive growth of military and commercial vehicle sectors in China and India. APAC airless tires market is slated to hold more than 30% of the global landscape by 2024. All in all, with automotive OEMs increasingly exploiting the potential of these cutting-edge tires for overall weight reduction and performance enhancement of the vehicles, airless tires industry is likely to witness a slew of opportunities over the ensuing years. The global revenue share is projected to surpass USD 200 million by 2024. This entry was posted in Automotive & Transportation and tagged Aftermarket, Airless Tire, Airless Tires Industry, Airless Tires Market, Airless Tires Market Share, Airless Tires Market Size, Bias, Global Airless Tires Market, HCV, LCV, Military Vehicles, Motorcycles, OEM, plastic, Radial, Rubber, Terrain Vehicles, Utility Vehicles.